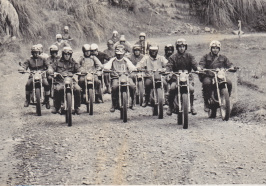 This section is hosted on my adventuresnz.com site and is set aside to showcase photos from our off road riding past, here in NZ or relating to Kiwi riders. My own archives are mostly from the years of my personal experience, from the the late sixties and I have made a cut-off at the mid eightiies, as anything later than that seems relatively modern to a rider of my vintage. I have roughly divided the pages into trail riding, enduro, motocross and adventure sections. Many of my photo collection will also appear in the relevant years in the NZ Enduro history section. As well as posting my photos I invite you to share your photos with us as well and hopefully create a meaningful archive of our wonderful recreation. Please e mail scanned photos in file sizes 500k to 1.0 meg to jnick@nztrailrider.co.nz Please include your name and a little about the photo.